President Vladimir Putin called Russia’s military forces “a weighty argument against any provocation” and promised to further strengthen and modernize them in cooperation with allied nations. “A modern and well-equipped army and navy are a guarantee of the Motherland’s sovereignty and independence, as well as of our citizens’ security. They are a weighty argument against any attempts to provoke us, against blackmail or pressure on our country. 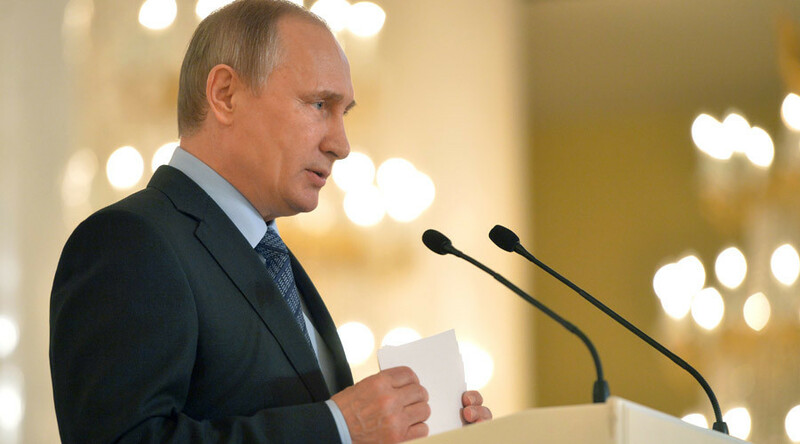 I have no doubt that you understand this well,” Putin said on Tuesday as he spoke at the ceremony for distinguished graduates of Russian military and law enforcement schools. The event was attended by about 700 graduates and senior professors. “Today we are working to solve a lot of large-scale tasks. But strengthening our military forces is definitely is definitely the most important of them all,” he added. “The strategic course for modernization and perfection of the military forces remains unchanged. The operation of our air force and our navy in Syria has confirmed that this course had been correct and that it had been implemented effectively,” Putin said. “We will continue to optimize the structure and numbers of our army and navy and take the system of coordination between units to a new level, including the coordination with our allies,” he noted. “We will also continue to equip the troops with perspective weapons and hardware as provided by the state rearmament program for 2018-2025 that is currently in development. The emphasis will be put on the most advanced high-precision arms, advanced hardware and communication devices,” Putin told the graduates. He added that these weapons and hardware require properly-trained personnel to operate them and these, in turn, needed qualified and effective officers in command. The president also made a special statement for those of the graduates who finished the schools for law enforcers and special services saying that these branches of Russian “power structures” had proved their effectiveness in many recent operations. At the same time, he urged the audience to keep moving forward and to be more resolute in fighting extremism, crime and corruption. In February this year, Putin praised the military in a speech dedicated to Defenders of the Fatherland Day and promised that the development of armed forces will always be among the most important tasks for the Russian state. "Our armed forces must always be ready to respond quickly and adequately to any potential threats, stop any provocation and aggressive actions," Putin said. Earlier this month, Putin’s press secretary Dmitry Peskov commented on major military exercises launched by NATO in Eastern Europe by saying that Russian military and special services were keeping an eye on all NATO’s activities. “Our Defense Ministry and all responsible services are duly watching all changes in the dislocation of foreign military forces near our borders. They analyze all changes and movements, and take measures to defend Russia’s interests and protect its security,” Peskov said.